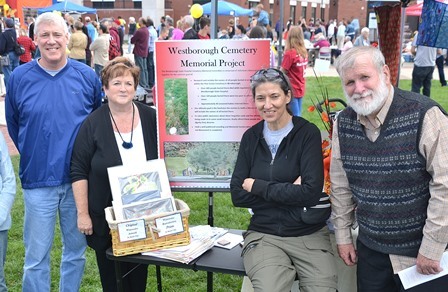 (l to r) Selectman George Barrette, Barbara Banks, Sarah Utka and Glenn Malloy participate in the recent Arts in Common event as a way to spread the word about the Westborough State Hospital Cemetery Memorial Project. Photo/Ed Karvoski Jr.
Westborough – In 2010, state officials decided to close the 125-year-old Westborough State Hospital, located on Lyman Street on the shores of Lake Chauncy, and move all of its patients to a facility in Worcester. The town is currently accepting bids on the nearly 100-acre property, and its dozens of buildings, many of which are in a severe state of disrepair. From its early days in the1880s as the cruelly named Westborough Insane Hospital to its later incarnation as a state hospital, the facility was home to thousands of patients. 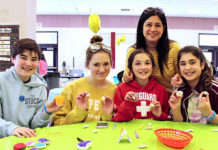 Many were there until the end of their lives, suffering from mental illness, and too ill to go back home to families who could not or would not support their complex needs. Over 600 of those patients did not have proper funerals or memorial services for various reasons, such as lack of remaining family or no record of final instructions. Instead, they were interred in plain wooden boxes at the town’s Pine Grove Cemetery near what is known as the “paupers plot.” Many were too poor to even have a gravestone. Instead, their graves were marked with a small numbered stone, many of which have now disintegrated with time. The final fate of these patients, who were buried without fanfare, appeared to just be a sad footnote in the hospital’s – and the town’s – history. But thanks to the efforts of the members of the newly reformed Westborough State Hospital Cemetery Memorial Project Committee, as well as others dedicated to the cause, those forgotten men and women will finally get the dignity and respect they are long overdue. The committee is hoping to not only raise awareness about the patients but is also actively seeking funds so that a memorial can be built at the cemetery to honor the patients. They are already working with Ed Clinton, an architect from Holliston, on a concept for the memorial. The memorial, estimated to cost $30,000, will have five granite slabs, with a bronze plaque mounted on each with approximately 100 names of former patients. In addition, two local Boy Scouts, Tim Sherman and Colin Caron, have each devoted time using metal detectors to locate the graves and then mark them. 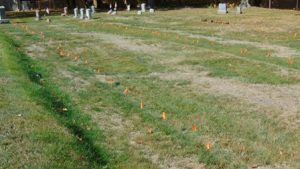 For Tim’s Eagle Scout project, he proposed finding and resetting as many of the unmarked graves as he could find. He spent 63 hours planning the project and supervising the 25 volunteers that worked for 160 hours on it. A total of 366 grave markers were reset. 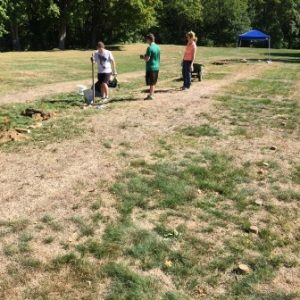 Colin is continuing this fall to work on the project of locating more graves. 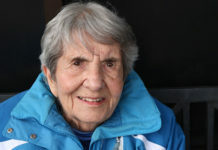 And as a participant in the town’s senior property tax relief program, Westborough resident Barbara Barnes created a database by matching up records from old town ledgers to the Scouts’ findings. Through their combined efforts, hundreds of patients’ graves have been identified. Donations for the project can be made via check (made out to “Westborough Cemetery Memorial Project Fund”) and mailed to: PO Box 3198, Framingham, MA 01705. The Cemetery Project Committee meets once a month in Town Hall. 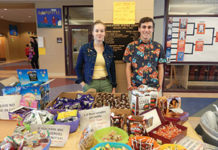 The next meeting will be Monday, Oct. 24 at 6 p.m. For more information contact Sarah Utka at 508-320-5120 or [email protected]. Donations can also be made on the group’s Facebook page (http://facebook.com/WestboroStateHospitalCemeteryProject) and by clicking on the “Go Fund Me Link”: http://facebook.com/WestboroStateHospitalCemeteryProject. All donations are tax deductible. Scouts and volunteers search for gravesites of Westborough State Hospital patients at Pine Grove Cemetery.